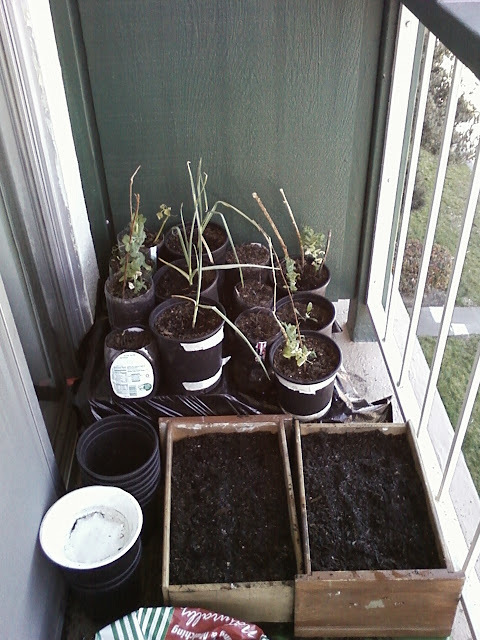 After much experimentation, my optimal garden location is right outside my bedroom door, the upstairs balcony. I live on the third floor of an apartment complex, so the elevation above the trees allows for more light to hit the balcony during the morning. I have created about 5 different planting areas on the balcony. Here is a diagram in MS paint that I shall use to help explain. Areas 1-3 are plastic bins. 1 and 2 are 22 gallons, and 3 is 18 gallons. The bins are big enough to handle multiple plants and bigger plants. This is the biggest planting area. Each bin was $5 at local hardware and department stores, thanks to Christmas sales. Areas 4-5 consist of sub-irrigated planters and 1 gallon plant pots. I would call this the terrace because I found 2 boxes to elevate the planters that occupy this area. 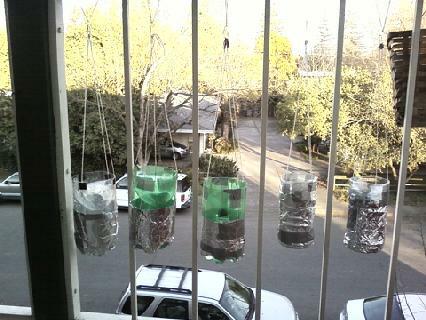 I overspent a bit on 1 gallon pots, but the sub-irrigated planters were fabrications from upcycled 2 liter bottles. Area 8 is my newest addition. I found two desk drawers sitting on the side of the road and thought they would be the perfect sized planters. I cleaned them up (a lot of mold and rot) and drilled some drainage holes. 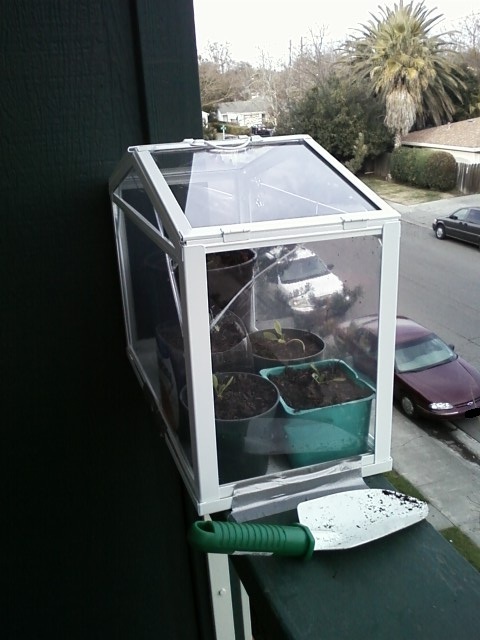 Using the lid that came with the 18 gallon tote, I assembled them to fit right next to the terraced area. For now, I have sown some spinach seed for a small spring crop. Area 9 represents plant pots I have placed around the drawers. 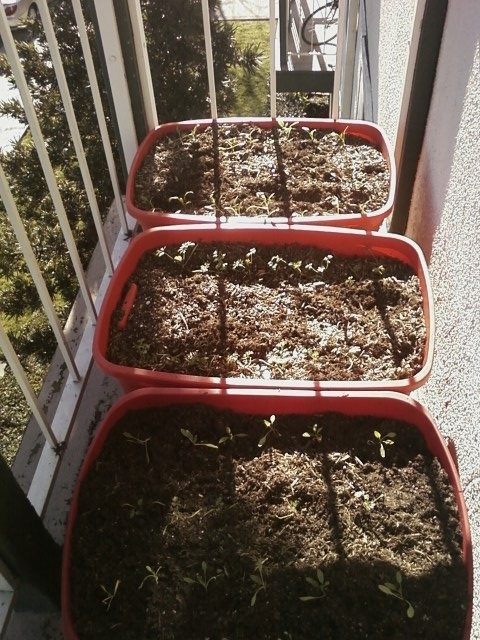 They will have cucumbers and possibly peppers or tomatoes. Area 6 is my mini greenhouse which I received as a gift. Here are the product specs. For being only $20, it is an incredible bargain for its utility. It's similar in cost to if you wanted to create your own out of materials lying around your house. I'm able to keep several small plant pots in there with small plants and seedlings to help them along. I'm not sure how warm it keeps the plants, but its definitely warmer than being exposed to the cold outside. Planter size pending, I can fit about 8 plants maximum in its 17.75''x8.75''x13.75'' frame. Area 7 is where I hang my hydroponic planters from the balcony. You can read about them here. Area 9 is the extra section where I store my extra pots and soil. I will use this area to accommodate peppers in hydroponic planters and bush cucumbers.